The NBA season is quickly closing in on the Christmas Day showcase, which for many sports bettors is the first time they’ll get action down on the Association since the start of the season. But if you want to beat the crowds – and find the best Best Online Sportsbooks betting value – these are some NBA Championship title odds to take a long look at before the NBA steps onto the big stage in the New Year. LeBron James departure for the West left a massive power vacuum in the Eastern Conference and it appeared the Boston Celtics were first in line to take over the top spot. However, someone forgot to tell the Toronto Raptors. Toronto is set at +600 to win the NBA title (behind only Golden State at -160) and Boston’s stagnant start to the year has moved it to +900 odds. Honestly, this is a steal. Boston has the star power in Kyrie Irving and Gordon Hayward along with a proven core of young talents that carried this team despite losing those two superstars to injury last season. Injuries could rear their ugly head again in 2019, but if you look at the Celtics ability to matchup with the Warriors, they fit that bill better than any other Eastern Conference contender. Despite adding scoring chops by trading for Jimmy Butler, the Sixers still sit behind a number of Eastern teams on the NBA futures board. This is a young and inexperienced team, but there is a surplus of talent just waiting to break out. Philadelphia does need some help on the perimeter if it is going to keep pace with the top teams in the league – more importantly win a finals showdown with Golden State. 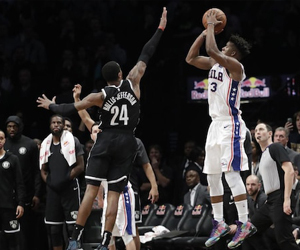 Markelle Fultz’s ongoing health – and possible mental issues – are a blemish and the trade for Butler doesn’t leave much in the way to poker chips if Philly does want to add depth in the backcourt. After a terrible – and drama-rich – start to the season, basketball bettors have pretty much written off the Houston Rockets. But let’s remember, this was the top team in the NBA last season. And with the Carmelo Anthony experiment coming to a close, Houston can really start to fix its chemistry issues and return to form before the New Year. The Rockets aren’t scoring at the same pace as last season, putting up just under 107 points per contests. However, their recent efforts have been more fruitful and people also forget that this is a solid defensive team as well, ranked sixth in points against Brace for some moves from this team before the end of the regular season, as it tries to beef up its interior presence. This could be the best price you’ll get on Houston all season.